An interesting article here with links to a variety of organizations that are working to provide technology and educational opportunities to those who typically do not have access. Thanks to Mercedes Bell for passing this along; content from OnlineUniversities.com. Here is the article – enjoy! As part of the monitoring visit, we were invited to Mrs Krot Thuk’s home. Mrs Krot Thuk lives in the village with her husband and her 4 younger children. Before Mrs Krot Thuk received a water filter, the family used to drink directly from the nearby well and pond (the pond was used during the dry season when the well had run out of water) and family members would suffer from waterborne diseases on average 2 or 3 times a month. Mrs Krot Thuk explained to us that she did not like going to the local commune clinic as she had never seen any positive result. She would instead try to go to Siem Reap hospital as much as she could (Siem Reap hospital is situated approximately 70 km away) which could cost the family between $25 and $75 a month. Mrs Krot Thuk who has been using her water filter since August 2012, explained to us how the filter has impacted the family who no longer suffers from chronic waterborne disease. Family members are now confident about the quality of the water they drink and are even drinking more water as a result. They also take the filtered water with them when they go and work in the fields. Mrs Krot Thuk commented on the fact that the water no longer had a smell and candidly asked us why. Mrs Krot Thuk is part of the water saving scheme (money saved to replace the clay component of the filter every 2 years). She was delighted to tell us that she now has extra cash which she is using to buy supplementary food for the family. Mrs Krot Thuk wants to thank everyone who has contributed to her water filter and wishes us all a long and healthy life! 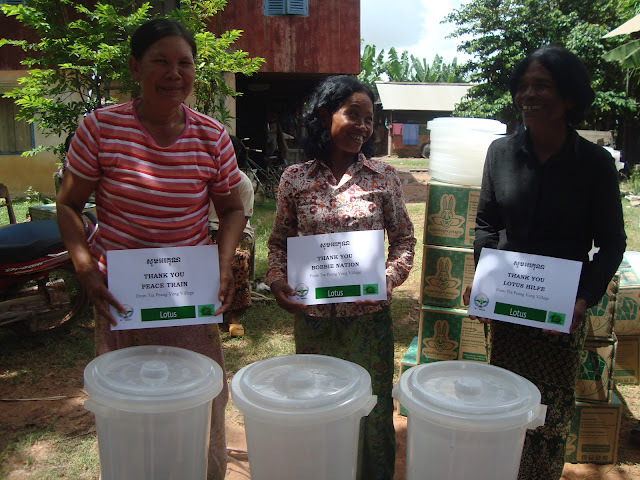 April 5, 2013 update from Cambodia on the impact we made with the funding of water filters for rural villagers. What great news! A huge THANK YOU to the great team at READA, Sandra, and our fabulous Peace Train supporters. I am delighted to let you know that the water filters provided by Peace Train were … distributed to 19 families in Tra Peang Veng village on Friday 24th August!! READA’ s Field Officer, Sineng Yoeun, provided the community members with training on water hygiene and water filters maintenance. As part of this initiative, a saving scheme was also set up to enable families to keep maintaining their filters and to promote ownership. On behalf of the Tra Peang Veng community, READA and Lotus, I wish to thank you and the Peace Train team for your hard work and great support! It has been quite some time since we updated the website last! After PeaceFest 2011, the team took a break and went about the rest of our lives for a while. As many of you might know, Peace Train is an all-volunteer, distributed organization of people with shared interest in making a positive change in the world under the large and encompassing banner of ‘peace’. These women are in a small village in Cambodia and are among the recipients of water filtration systems (and the training on how to use / maintain them). PeaceFest contributions in part went to support this effort. Notice the sign that the woman on the left is holding! Many many thanks to Sandra Bérard and the team at READA for following up with us. I am going to copy in below part of the message I received this week from them. In addition, please see the link here to the full set of photos from the training and filter distribution. Truly inspiring work these people are doing! UPDATE: Please check out the video here! 2012 is right around the corner – the holidays of this time of year are speeding along it seems. A quick update: The funds from IMAGINE PeaceFest have been distributed to two of the 3 organisations (RAWA and OLPC); and I am still working on the transfer to Cambodia for the READA group. I’ll post an update when all is completed! Feels great to close the loop and to get the help to those who need it – thank you ALL for your support! 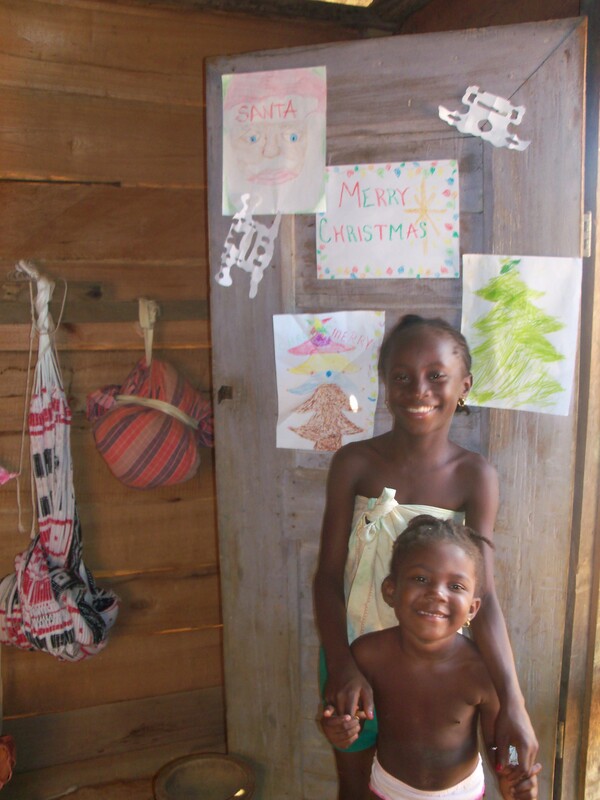 If you are thinking about other worthy causes, here is work that one of our Peace Train members Erica d’Aquila is doing in Suriname in her capacity as Peace Corps volunteer. I’ll paste in her message below, and have added a couple of photos she has sent. It would be terrific to help her and her village reach their funding goal for such an essential and basic need. If you’d like to hear an interview with Erica and see more photos, click here. 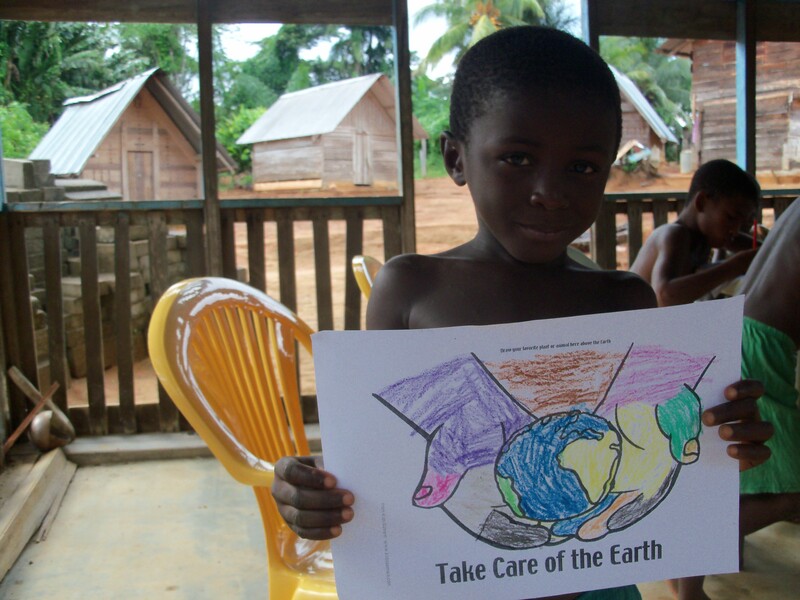 As many of you already know, I am still trying to raise the funds to resolve the lack of clean drinking water in the village, Pempe, where I am currently serving as a Peace Corps volunteer in Suriname. Together, we have already raised 4,000 USD; however, the project still needs an additional 6,000 USD before it can be implemented. The funds from this project will purchase 43 rain water catchment systems. These catchment systems will provide clean drinking water to the 140 men, women, and children living in Pempe year round. Currently, the only water available to the village for drinking has been tested and shows the presence of E-coli and other harmful bacteria. As a result, water borne illnesses are amongst the most common health problems in the village. Water borne illnesses are often the cause of malnutrition in children, and prevent adults from traveling to their farms to harvest food for their families. Please take the time during this holiday season to give the gift of clean drinking water to the men, women, and children of Pempe. I ask that you also encourage your families, friends, parishes, and colleagues to join us, so that together we can make this project a success! This project must raise the full 10,000 USD by February 2012 or else it will not be happen, so if you can think of any way of getting the word out there, please help us out! Your donations and support will be making a huge impact in the lives of all of the adults and children living in Pempe, and it is greatly, greatly appreciate. NO donation is too big or too small! Have a wonderful, merry, happy holiday season! Starting a series of interviews! They will be featured here, and I wanted to include the latest interview with a Peace Train member and Peace Corps worker, Erica d’Aquila. Check it out! One week ago we began IMAGINE PeaceFest. We set ourselves a goal to raise awareness about peace-building organizations in the world, and to gather a few funds to give to them. To do that – you, the artists, performers, organizers, poets, singers, bands, attendees and donors – you all came out to join us. Thank you all! http://ireport.cnn.com/topics/1307 Many thanks to that marvelous avatar-reporter Any1 Gynoid for her contribution this year. IMAGINE Networks blog updates. Many thanks to Ms. M. Chevalier and Mr. J. Stockholm for their steady spirits and collaboration! Our interview with READA Cambodia’s Sandra Bérard. Thanks to Ms. W. Whiteberry for her guidance, patience and skill! To the gentlemen interns at Old Dominion University – Mr. T. Norton and Mr. G. Selden – thank you for getting us into the social media realm and organizing the spoken word event! I will post more details on the summary collections and links to pictures from the events once I return from travels – travels that unfortunately took me away from the last day of the event. I hear it was great! The schedule has been updated with links to locations. A big thank you to all the performers who are lined up for IMAGINE PeaceFest – those great people at ODU! And all those great people wherever they are who are giving their time and talents to help people who could really use a hand. 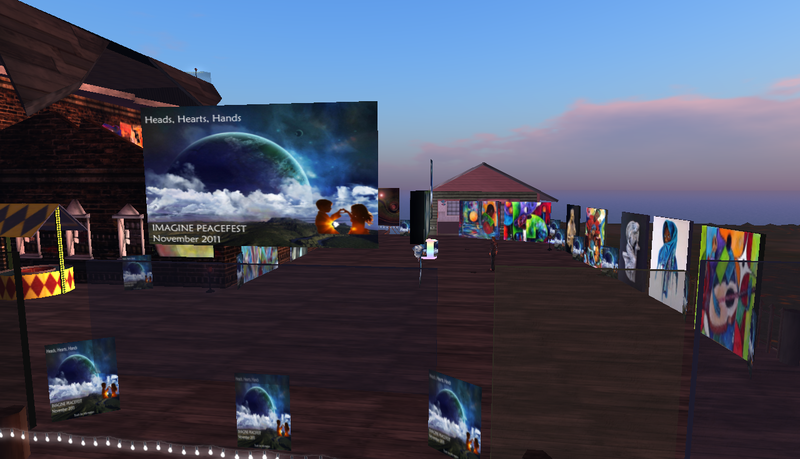 Thanks also to the Nordic Virtual Worlds Network for giving us a shout! There are many others to thank – Beverly Botsford, John Steed and the very talented Russ Corvey for their fantastic talents in the videos produced. The list goes on. If you want to help, please do. The women in Afghanistan will be helped, the kids with new connections to the world will be helped, and the villagers in rural Cambodia will be helped. Thank you.